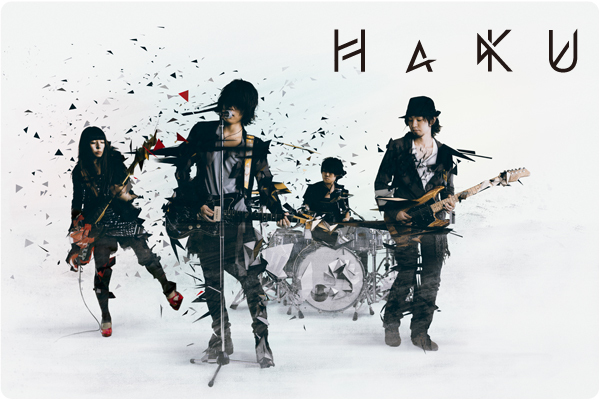 HaKU is a rock band formed in Osaka in 2007. It consists of Yuki Tsujimura (vocals, guitar), Hiroshige Fujiki (guitar), Haruna Miyoshi (bass), and Shinya Hasegawa (drum). HaKU mainly performs live in the Kansai region. The band has aroused attention with Tsujimura’s unique high-pitched voice as well as its particular adherence to constructing electro sounds using the raw sounds [from their instruments]. In January 2009 the band released its first recording “White Light”, and it released the mini-album Breath in the Beat in November of the same year. Since then, along with the steady release of further works, they have been holding live tours across Japan. In February 2011 the band had its first solo performance in Tokyo and Osaka. In September 2012 the band embarked on its first overseas tour in Malaysia, and had its major label debut with the release of the album Simulated Reality in the following month.